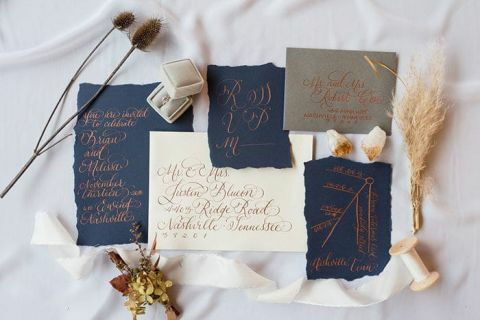 White Ink Calligraphy created a dramatic navy blue and white invitation suite with gold lettering to hint at the rich colors in this wedding shoot! 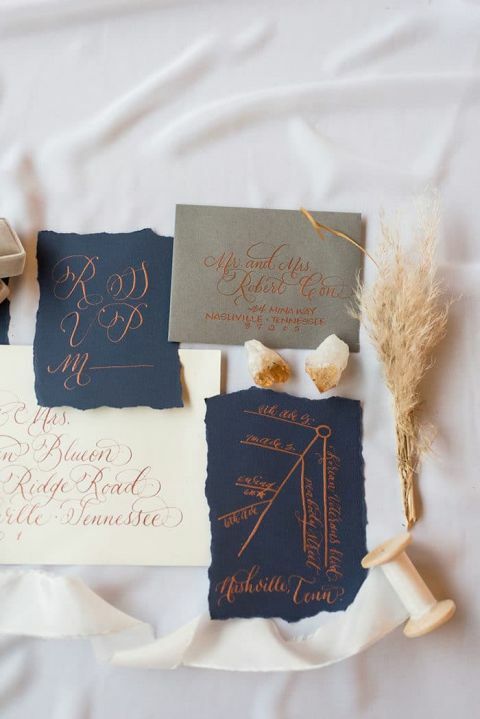 Little accents of pampas grass made sure to keep the modern boho vibe in every detail. A star map marked the wedding venue! 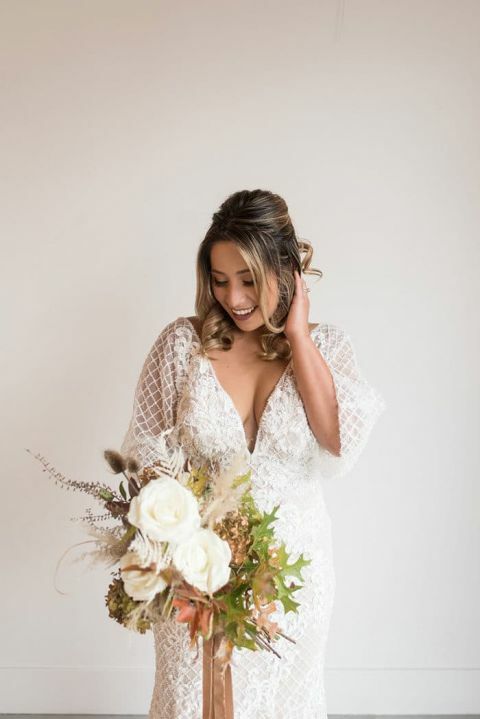 The team made sure style blogger Nathalie looked every inch the bride in an Allure Bridals wedding dress from TN boutique, The White Room. 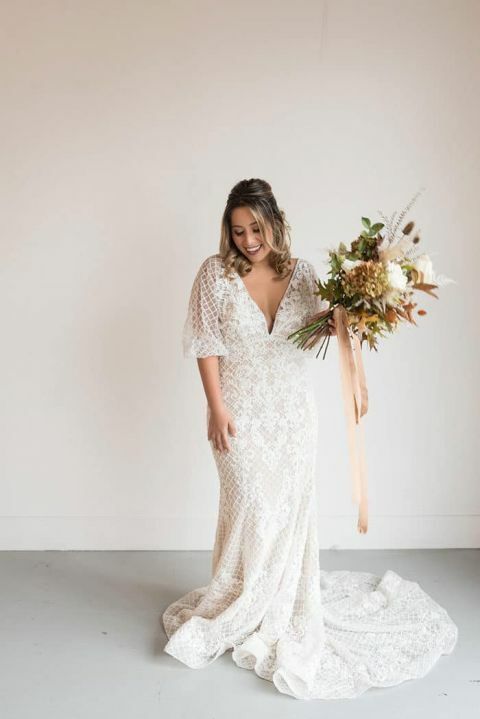 The modern lace pattern, low back, and flutter sleeves created the perfect look for a boho bride. Hair stylist Karleebeauty and makeup artist Beneath the Sequins opted for a romantic look, with a half updo and natural makeup. The groom went for modern black tie in a sleek suit and subtly patterned accessories. Mercy & Thyme Blooms created dramatic pampas grass installations for the reception, but kept things simple and organic for the bridal party’s personal flowers, with white flowers, dried grasses, and foraged greenery for the bride’s bouquet and the floral collar for the ring bearer – a goldendoodle named Annabelle! They created a uniquely memorable ceremony backdrop with an enormous chalkboard wall. Foraged fall greenery decorated the calligraphy love quote written on the blackboard, making for a dramatic and graphic modern wedding ceremony. The vision for the reception space was modern, industrial, and organic – an enormous pampas grass chandelier hanging from the exposed ducts easily accomplished all of them at once. The oversized Kings table and acrylic ghost chairs added to the drama. Dried pampas grass adorned the center of the table, paired with. Crystal goblets, white and black plates, and copper flatware created modern and dynamic place settings. White lettering on the acrylic chairs doubled as place cards! The team and I have to agree – one of the most unique details of the shoot is the cake! Katelin Hayes Desserts created this absolutely masterpiece of a dessert, with layers of modern fondant adorned in sugar ruffles. The blue and orange accents and edible gold leaf flecks created a wave effect that turned it into a work of art. This gorgeous pair finished the evening with a photo shoot that took in the beauty of downtown Nashville. The dramatic facade of War Memorial Auditorium offered them an amazing urban backdrop to finish off a day of creating incredible wedding inspiration!